This semi-home Easy Chicken Noodle Soup Recipe is quick, hearty and delicious! Can be made-ahead and makes the perfect busy weeknight meal or Sunday Supper. Not your mother’s chicken noodle soup recipe! Hello and welcome to another edition of Sunday Supper featuring this easy chicken noodle soup recipe that is truly comfort food at its best. This is not your mother’s chicken noodle soup either. It’s so easy and fast. I would call it semi-homemade and it literally takes 15 minutes to put together. When the noodles are done, it’s ready to eat. This easy semi-home easy Chicken Noodle Soup Recipe is quick, hearty and delicious! Can be made-ahead and makes the perfect busy weeknight meal or Sunday Supper. 2 boxes chicken broth 32 oz. In a large soup pot melt the butter. Add all the chicken broth, both boxes and cans. Pick the meat off the rotisserie chicken and add to broth. Make sure to pour any juice in the bottom of the chicken bag into the broth. Add almost the whole bag of noodles leaving a handful in the bag. I always pick up an extra box of chicken broth. If the soup gets too thick, just add more broth. 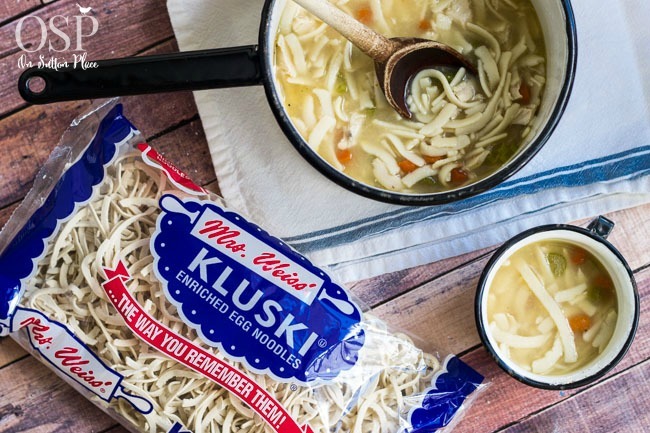 I have tried different brands/types of noodles and my favorite type to use is kluski. They may be a mid-western thing because my cousin, who lives in Texas, can’t get them. In my humble opinion, they are as close to homemade as you can get out of a bag. This is one of those soup recipes that just gets better after it sits in the refrigerator for a few days. It can be made ahead and freezes very well. If you are a crockpot user, all you have to do is saute the carrots and celery on the stovetop, then transer them to a crockpot. Add the rest of the ingredients and let it sit on low for a few hours. You will know when it’s done because the noodles will be cooked. What makes this easy chicken noodle soup recipe so easy is using a rotisserie chicken. If you prefer not to use one, pieces of chicken can be baked or boiled and then shredded. The two cans of Campbell’s broth add a little extra flavor because it’s thicker than normal chicken broth. If you can’t find it, or prefer not to use it, just use extra of the boxed broth. Easy and fast, that’s my kind of soup. Looks delicious besides being easy. Anne, this is the best chicken noodle soup I’ve ever made! It was so delicious. I was fortunate to find the noodles you recommended and that was one huge difference. It just all came together wonderfully. What I like about this recipe is that if I were not feeling well, it would be no trouble to make and I know it would make you feel much better to have it to nurse yourself back to health. This is definitely a keeper for me! I’m so glad you liked it…and it’s super easy I agree. Thanks for taking the time to let me know! My family loved this soup. I’m making it again today! This soup is delicious. It was a BIG hit with my family, and will go on my regular rotation of recipes. My husband works out side all day shoveling snow. I made this for him for when he got off of work. He LOVED it. Note: he is a picky eater. Thanks for that recipe! Always looking for something easy to make after getting home after an hour commute! Love your blog, your home, and your friendly approach. I’m making chicken soup today, and I’m going to try your recipe! Hi Ann I have been following your blog for about 4 months now and love it. I live in Bendigo which is in central Victoria Australia where we are experiencing very hot weather with threats of bush fires. I have printed out your soup recipe and look forward to try it next winter. Stay safe Sharyn and thank you for taking the time to leave a comment! Thank you for sharing this recipe, I look forward to trying it. That’s sounding particularly yummy to me right now, as the rain is hitting the roof. 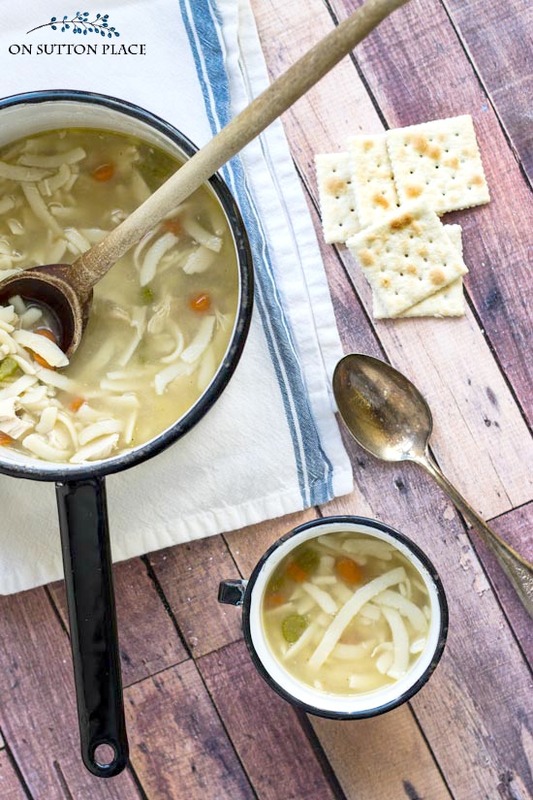 My husband has a cold – he could use some chicken soup! Happy New Year, Ann! I made this for dinner tonight….it was DELICIOUS! I live in Green Bay, WI, it’s 4 degrees outside, and we have a 2 hour delay for school tomorrow…with this type of weather, it was the perfect meal. Easy and quick to make and I loved the idea of using rotisserie chicken. I go back to work tomorrow after the holiday break and we will have leftovers tomorrow night. Perfect Beth! Hope you had a good first day back to work too. Perfect comfort food for this cold winter day here in the Carolina’s. I love those noodles too! What a delight to find this recipe on your blog this morning! I cannot wait to try it to surprise my sweet hubby. Chicken Noodle soup is one of his favorites and this sounds delicious! Thanks Ann for your continued inspirational ideas and suggestions. Happy New Year! Hi, Ann! I have been following you blog for a couple of months now, and I LOVE IT! Thank you for providing recipes, as well as gorgeous home decor ideas. I borrowed many of your ideas and recipes during the Holiday season, and I can’t wait to see more! Thanks for being great! 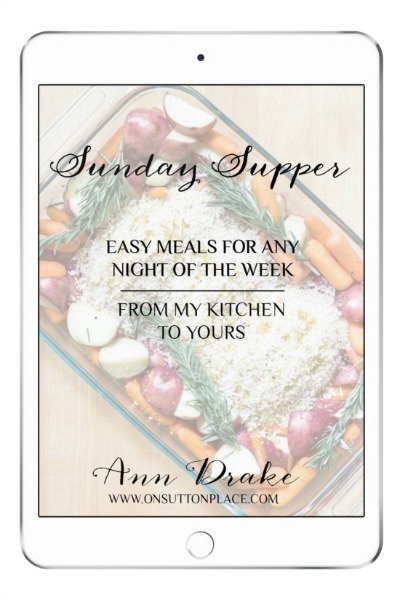 Thanks Anne this will be wonderful,the sun is shining bright here in Okla. but it is 22 degrees outside so i am making this now.Have a wonderful day. I have never heard of that brand of noodles before and don’t think I’ve ever seen them in the store either. I love recipes that get better after a few days. It think soup is always that way. Yummy!! I am curious why you used both boxed and canned chicken broth? I love any kind of soup, I live in upstate NY soup country.This looks easy and quite tasty! Nothing hits the spot on a cold January day like homemade chicken noodle soup. This recipe sounds terrific. This sounds great for a cold snowy day. Happy New Year Ann!! I can’t wait to try this! It sounds super simple and the ingredients easy to purchase.We don’t have that brand of noodles in NC but can get something similar at Fresh Market. I am curious on why you use both boxes of broth and cans of broth. Is it a flavor profile? Thanks for sharing a quick dinner! I was curious about the two different chicken broths as well. Thanks for any info and also for all your sharing.